grandma's cookie jar: birthday month give-away - Polar Bear Cub Puppet! Usually a couple times a year I have the opportunity to review puppets from Folkmanis. They make the most amazing and wonderful puppets . . . they are soft and plush - more like a beautiful stuffed toy, but they are actually puppets! This Spring they sent me several wonderful puppets which I'm happy to let you know about today . . . and announce a give-away for one as well! So soft! This funny looking puppet is fun to snuggle. Comes with interesting information about platypus babies . . . such as they are born with teeth, which they lose at a young age and then use gravel to help break down and digest their food. Great size for children to use as a puppet. Folkmanis says; "The unique BABY PLATYPUS puppet is a curious-looking animal with webbed feet, furry beaver tail and a smooch-able, puckered up duck bill. Animate the mouth and front feet as you gaze into sweet, emotive eyes and you'll fall in love with this unusual creature." My grandsons immediately started hugging this puppet and named it, "Perry", even though it isn't turquoise! I love how soft the "fur" is and how it shows what a platypus looks like. Such odd creatures! How fun to have one as a puppet! Encourages wanting to know more about these amazing creatures! Folkmanis says; "An ancient marine creature, the SEA TURTLE puppet is beautifully rendered with patterned shell, scaly-looking body fabric and suede cloth underbelly. Her wise eyes and movable mouth tell the story of her ancestors as her front flippers propel her to the depths of the sea and your heart." I love turtles, so this puppet is one which I think is just beautiful! Sea Turtles are such amazing creatures - a sea turtle puppet is unexpected, but since it is made by Folkmanis, is is soft and plush and more than just a puppet - it can actually, surprisingly, be a "friend" to snuggle! Realistic design - you really just want to pick it up and hug it! Folkmanis says; "Adorably shaggy, the chocolate and peanut butter colored YORKIE PUP looks real when you move his mouth and sniff around with his little snout. Use your free hand to wag his tail and the illusion is complete." I think anyone who loves dogs will find this puppet to be adorable . . . and if you are particularly fond of Yorkies, it is sure to be a favorite! My little Shane took one look at it and began barking! Once again, Folkmanis showed how they pay attention to the details with this puppet! Josiah donated this puppet to his First Grade class, so a lot of children are going to enjoy playing with this little pup! So soft, so furry, so snuggly! Details are excellent - like the little toe nails! Did I mention how cute and snuggly this puppet is?!! 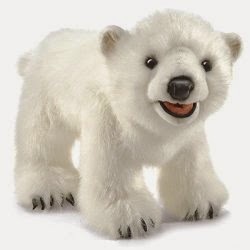 Folkmanis says; "Out of hibernation and fresh from the den comes the newest POLAR BEAR CUB from Folkmanis® Puppets. Heirloom design with soft plush fur, padded paws and a workable mouth, this cuddly glacial gladiator will easily find a warm place in your heart." I love this puppet and am so happy for the opportunity to give it to one of you! The give-away will be on May 18, 2015 (USA only) so if you are over the age of 18 and would like to be in the drawing for the Polar Bear Cub Puppet, please comment below to let me know what animal you most want to see when you visit the zoo . . . for me, although bears a fun, it would have to be the giraffe! In addition, you will receive additional entries if you have followed on Google+, Google Friend Connect, followed by liking on facebook with the tab at this link (not just liking the post) and/or have followed grandma's cookie jar by email. For each of these which you have done you will receive one entry. In addition, if you "share" this post, you'll receive an additional entry (please let me know if you share). This will help me be able to draw names from among people who would like to win the Polar Bear Cub Puppet and it gives you several ways to enter the give-away! My favorite animal at the zoo is the giraffe but I also love watching the penguins in their tuxedos. I follow on facebook and email. My favorite animal to see at the zoo is the giraffe! I the peacocks, beautiful and so very colorful. Following on facebook, gfc, Google + and through email. I love the zoo. I go for the tigers or monkeys the most. Liked, shared, follow Google+ , email, FB. My favorite animal is the tiger. I liked on FB and follow by email. I've shared this post as well. Thanks! I love the zoo, so I had to really think about this question...If I have to say one, I think my favorite to see are the Tigers. Thanks so much for the chance to win! I follow on FB and by e-mail. I love the elephants at the zoo the most.